Castelli's Velocissimo 3 Tight both feels and performs like more premium models but without the higher cost. The Thermoflex fleece fabric used throughout is plush and is excellent at fighting off bitter temperatures. The dual-density, bacteriostatic KISS Air chamois keeps you comfortable all day long by sharing the seamless anatomical design of Castelli's higher-end Progetto X2 Air pad, and camlock ankle zips make the Velocissimo Tight easy to pull off after a hard day of riding. As with all Castelli products, very comfortable and well crafted. Early spring and late fall rides and commutes. Fits and works well, comfortable under an insulating layer when necessary. Great product, amazing fit, high quality and a price that couldn't be beat. Always quick delivery and outstanding service. These are a good quality (I actually bought the version without pad for over my bibs) & have nice ankle zippers. But, I'm only 29-30 waist & these in small say 31 12, but they're waaaay too tight in the waistband, so I'll have to return them. One other thing I didn't care for is that they seem to bunch up behind the knee if you bend it in a pedaling motion. They'd be fine for x-country skiing. They conform well to my legs & feel great otherwise. Lining feels like it would be fine on cold days when a lycra only tight is too thin. Good padding, perfect fit. I have already logged 250 miles in these and they show zero wear. Great product to help keep you warm. But beware, fitting on this item runs tight. &40no pun&41. 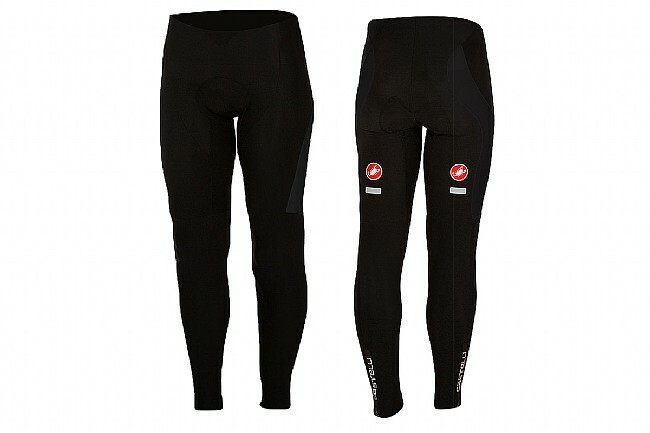 The Castelli Men's Velocissimo 3 Tight will certainly keep you warm when the weather gets a little chilly. Typically from 40F to 55F.